With SAS, it's simple to import the file into a data set. Here's my DATA step code that uses the INFILE statement to identify the file and how to read it. Note that the DLM= option references the hexadecimal value for the TAB character in ASCII (09x), the delimiter for fields in this data. 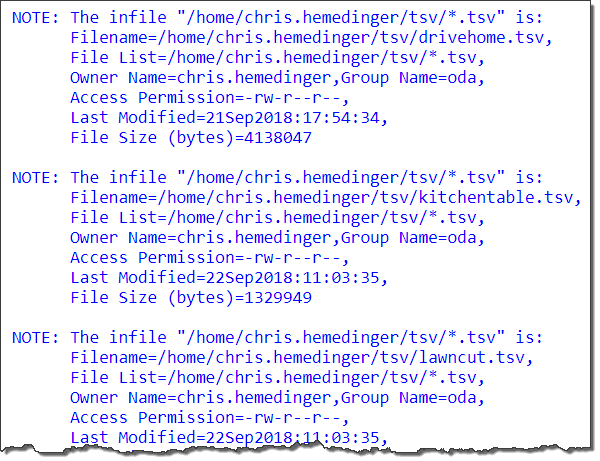 To import each of these data files into SAS, I could simply copy and paste my code 4 times and then replace the name of the file for each case that I collected. After all, copy-and-paste is a tried and true method for writing large volumes of code. But as the number of code lines grows, so does the maintenance work. If I want to add any additional logic into my DATA step, that change would need to be applied 5 times. And if I later come back and add more files to my TSV collection, I'll need to copy-and-paste the same code blocks for my additional cases. I can read all of my TSV files in a single step by using the wildcard notation in my INFILE statement. 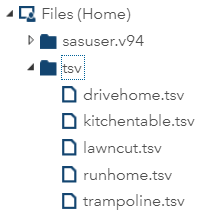 I replaced the "drivehome.tsv" filename with *.tsv, which tells SAS to match on all of the TSV files in the folder and process each of them in turn. I also changed the name of the data set from "drive" to the more generic "accel". The SAS log shows which files have been processed and added into my data set. With a single data set that has all of my accelerometer readings, I can easily segment these with a WHERE clause in later processing. It's convenient that my accelerometer app also captured the name of each TSV file so that I can keep these cases distinct. A quick PROC FREQ shows the allocation of records for each case that I collected. In the output, you'll notice that we now have the fully qualified file name that SAS processed using INFILE. In this single data set, we still have the information that keeps the records distinct (the name of the original files), so we haven't lost anything. SAS procedures support CLASS and BY statements that allow us to simplify our code when reporting across different groups of data. We'll have fewer blocks of repetitive code, and we can accomplish more across all of these cases before we have to resort to SAS macro logic to repeat operations for each file. As a simple example, I can create a simple visualization with a single PROC SGPANEL step. Take a look at these 5 series plots. Using just what you know of the file names and these plots, can you guess which panel represents which accelerometer case? Leave your guess in the comments section. Update: answers revealed (via SAS Visual Analytics) in this post! My first guess was that they are displayed in alphabetical order, but that just doesn't quite match my expectations. I'll venture #1 is lawn cut, #2 is definitely kitchen table, #3 is run home, #4 is drive home, and #5 is trampoline. I thought PANELBY orders the values in the filename column, making it drivehome, kitchentable, lawncut, runhome, trampoline? Although, that makes you a very smooth driver but erratic mower! On reading external files with the wildcard notation, I found this is great for text files with a stable structure. I found that when dealing with hundreds of files, I was almost certainly getting one or two that were irregularly formed and caused my data step to stop. That meant I needed to rerun the step from scratch, which can take a while if pulling text files from a far. I decided to loop with a macro processing them one at a time. That allowed me to better handle the file(s) that fail without stopping the rest of the data imports. It was also easier to see the performance of each read in the log file, something that became useful as files grew. I still appended the imports into a single data set, then you have one table to use down stream. Just my experience. It's a great example Chris, could the next step be streaming data from the phone into ESP for analysis? David, it's good to hear your real-world experience on this. ESP would be a great next step! The hexadecimal conversion syntax to convert tabs to text doesn't make a lot of sense to 21st century user. It just shows how long you've been reading text files in SAS. Edzard - I'm one of those who think all programmers should be able to count in hexadecimal -- that gives the kids-these-days an appreciation for how computers really work! What if each of the data files has field names in the first row? Using firstobs=2 appears to only apply to the first file in the in the folder. In the context of the examples I shared, I don't think I would use FIRSTOBS. There might be a more elegant method than this, but you might need to detect with the FILENAME= value changes (by RETAINing the value across iterations) and just discard the first _INFILE_ record for each file. Actually, I just came across this post from Reeza that shows how to manage this with a condition checking for _N_=1 and the EOV= option.